On sale September 16, 2014! Chunky and round, Oh, Baby! is a new kind of board book comprised of wide-eyed babies in action. From the joy of burping to the thrill of standing up, Chad Geran captures the highlights of babyhood. According to a recent study conducted by Stanford Vision and NeuroDevelopment Lab, "At as early as four months, babies' brains already process faces at nearly adult levels . . ." Based on this research, Oh, Baby will hold their attention longer and give parents more "face time" with their little ones. Oh, Baby! can be the book that reaches infants early and often. By touching the small, thick trim, babies develop visual and tactile awareness. Babies' motor skills become more pronounced, as they grasp each page. The irresistible, image-filled book allows them to learn. Parents stay close beside their little one for these milestones and proudly exclaim, "Oh, baby!" 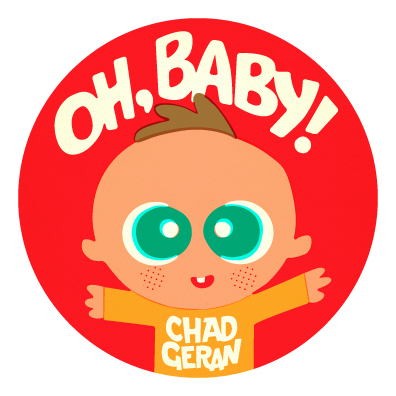 Chad Geran is an illustrator and designer who lives in Regina, Saskatchewan with his wife and two kids. Upon request, he is available for interviews and store appearances. High-res scans to your specification are available upon request; scanning from the book or lifting images from the mechanical file are strictly prohibited. Mandatory credit line: From Oh, Baby! by Chad Geran, published by POW!/powerHouse Books.